Your auction catalog is printed. All items have attractive displays. Guests are arriving shortly. Lo and behold, a Board member/volunteer/parent arrives at registration with a last-minute donation. They’d been meaning to get this to you, but just didn’t. First, turn away as you roll your eyes. Here’s a recent example from this past weekend. Upon arriving at the venue on Saturday night, I learned that a one-week summer stay in Martha’s Vineyard had just been donated. The 5-bedroom home was ideally located in Edgartown and could be used May, June, September or October. For that crowd, this was a prime item. We added it to the live auction as the last item (item #5). In my opening remarks, I also told guests the donation had been made, so they could appropriately plan for it in their budget for the night. It sold for a whopping $10,700. What to consider: Though I’m not a fan of adding items to a curated live auction, use common sense. If the item is worthy and your timeline can support a longer live auction, add the donation to the line-up. Many last-minute auction donations are tucked into the silent auction. Nonprofits running mobile bidding have it the easiest. They can type in a description about the item, snap a photo of it, and upload it into the digital catalog. The new item instantly becomes available for bidding. Though it’s better to have a display of this item on the tables as well, it’s not absolutely critical. At this school auction, they put a bright pink sticker on bid sheets of items that weren’t listed in the catalog. In contrast, nonprofits working with paper bid sheets have more work. A bid sheet needs to be created and printed. Space must be made on the silent auction table. And this all needs to happen quickly, so browsing guests have time to see it and bid on it. One client keeps fluorescent stickers handy to alert guests to 11th hour changes. See the photo for how they highlighted a “new” item with a bright pink “New!! !” sticker. What to consider: The downside of accepting and handling auction donations onsite is that it sets a bad precedent. If guests think it’s OK to arrive with donations at the door, you can expect more of them to ignore donation deadlines next year. Years ago I was working at a Catholic parish school auction when several families arrived at registration with unexpected donations. They were all smaller valued items — baskets with one to three items tucked inside. Some were shrink-wrapped. The Auction Chair politely accepted them, carried them into the silent auction area, and told me to use them as door prizes. She had no interest in rearranging the thoughtfully organized silent auction tables to make way for these late arrivals. What to consider: Nerves runs high at registration tables. The long-planned event is about to begin, and most Auction Chairs will be annoyed with a donor who shows up with any donation at registration. If the item is small, it might be OK to accept the gift and let the auctioneer make it disappear by giving it away as a door prize. Blame your auctioneer for the idea. Some nonprofits use their gala as the “kick off” to a post-event online auction that might run seven to 14 days. Online auctions held after galas tend to include items that didn’t sell at the gala and could be expanded to include last-minute donations that arrived at the event. What to consider: It’s a nice way to use the donations and allows those who were unable to come a chance to bid and contribute on the items. Some software platforms allow you to run a free online auction if it’s small in number. 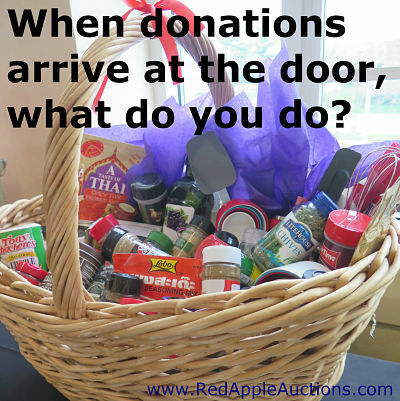 If you’ve gracefully handled last minute donations, how did you do it? Post your answers below.